Side wall between vessel members with differentiating helical thickenings. BSA Plant Images Online - Side wall between vessel members with differentiating helical thickenings. More mature cell (right) indicated by larger amount of secondary wall deposition. Vesicles between plasmalemma and secondary wall are evident. Side wall between vessel members with differentiating helical thickenings. More mature cell (right) indicated by larger amount of secondary wall deposition. 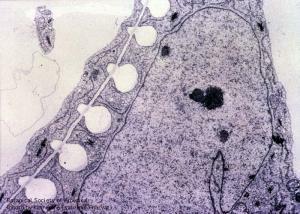 Vesicles between plasmalemma and secondary wall are evident.